DEWALT DW717 review by real customer-Is it right for you? For those people who don’t need a 12 inch blade for the larger cuts, you may consider checking out the DW717. While it isn’t as fully featured as some of the other products in it’s line, it will still likely be able to handle most of the cuts that you are going to want to make. 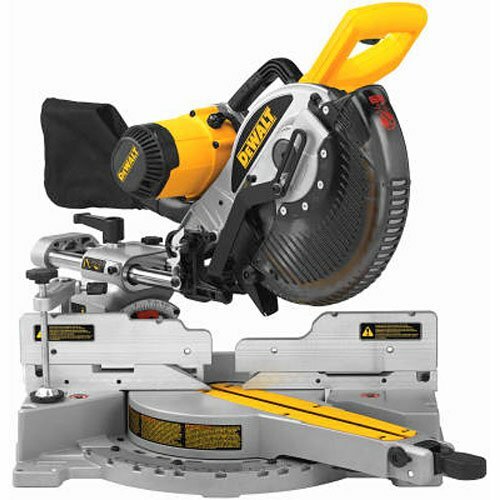 In this post we have covered detailed review of DEWALT DW717 10-Inch Double-Bevel Sliding Compound Miter Saw. Check comparison of dewalt dws779 vs dws780. 1.1 Is there anything that makes the DW717 special? 1.4 What feature set are you getting? 1.5 Should you buy it? Is there anything that makes the DW717 special? So you must be asking – what is so special about this miter saw? There are a ton of options out there, so filtering through the noise to make a good choice can be tiresome. With this one, you are going to be loving bevel cuts. With this one, you can make cuts anywhere between 0 and 48 degrees, which is plenty for the majority of projects out there. It also saves you from having to flip your cut – and instead just flip the saw. This makes things much easier to get done. Read difference between dewalt dws780 vs makita ls1216l. Read guide on choosing best affordable mitre saw. If you don’t want something that needs some major adjustments when getting, you will be pleased here. Most people upon arrival are able to use the DW717 out of the box without adjustments. There are a few people who needed to make a few changes, but overall the sentiment is good in this area. It can take some time to dial it in if you want the blade a specific way – and this saves time. Check the article on best tool box for the money. Are you planning to buy top miter saw stands ? Check former link. Tall fencing and rails make bevel cuts easy. What feature set are you getting? Truthfully, this is a great miter saw. However, we think there are better products out there. For this price, we think that looking at a few of the others in the price range, or looking at some of the other options that cost a bit more is worth doing. You are likely going to be using this for a long time, so we think spending a bit more for a product which does more is the best option. This is especially true for dust collection. This is one thing that we just didn’t like here. Will you be happy with the product? Most likely. Would you be more happy with something that is better – without a doubt. Check reviews of dewalt dws780, makita ls1216l, hitachi c12rsh2, bosch gcm12sd. The DEWALT DW717 is a saw that will work great for most people. Not everyone needs a 12 inch blade, so a 10 is most common. This machine from DEWALT will work great for anyone. It contains all of the major features for anything you want to do. Click here to read what Amazon customers are saying about DEWALT DW717.